April is upon us, and if you race in the United States, that means criterium season has started. Criteriums, or crits, are the staple of American racing. They are fast, exciting and challenging. Just like a road race or a time trial, the crit race is a breed alone. It requires special preparation, special training, special bike handling skills and, to do well, an aggressive approach to the race itself. Typically, most crits are held on a venue that offers a lot of turns, brief straight-aways, and maybe even a short hill or two. In crits, corners play a key role. A typical course has four to six turns that range from open and fast to tight and narrow. Since a crit typically lasts for 20 to 30 laps, that can mean taking 80 to 180 corners in a race. Learning to corner in a safe and fast manner is a skill you must master. Here are my four keys to cornering with speed and confidence. Riding in a pack on your local group ride or even a road race means that you are inches from the wheel in front of you, maybe bumping an occasional elbow. Now in a crit, you are getting ready to do all this AND MORE- approaching a turn at speed, slamming on the brakes, diving into the corner then accelerating out of it to get back up to speed. All this with a group of riders with the same goal as you, to get into the turn fast, go through fast and come out of the turn fast. You might even have someone yell, “HOLD YOUR LINE!” This means that you might have deviated from your “expected” path. In a corner, you are expected to follow the same line as the person in front of you. choosing your own line that differs from those in front is considered very dangerous. Simply put, you maintain your spot in the pack. Keeping as much speed as possible and lowering your center of gravity are two essentials to “railing” a corner, or going through as quickly as possible. Always putting the outside foot down and putting pressure on that foot will help lower your center of gravity. This is cornering 101. Staying in your drops throughout the race not only keeps your more aerodynamic, but also lowers your center of gravity allowing for more speed in the turns. The next step is counter steering. Countersteering is a skill that needs to be practiced before applying it in a race. It is simply defined as putting slight pressure on the handlebars on the side you are turning into. If you attempt to make a right turn on your bicycle before first leaning your bicycle over to the right, centrifugal forces will cause you to crash by falling over to the left. Leaning the bicycle to the right allows gravity to cancel the centrifugal forces. But how do you get the get the bike to lean to the right? By countersteering, i.e. by turning the handlebars to the left. In other words, to make a right turn, you first turn the handlebars slightly to the left. The centrifugal forces will then lean you and your bicycle in the proper direction. Doing this lets you carry more speed through a turn. Get a feel for this before doing it on the race course. An empty parking lot with traffic islands, etc. makes a great practice course. Go through a few turns as your normally would. Then start to apply the countersteering technique. Not too much pressure or speed in the first few turns. Get a feel for it. Then build up to point where you are countersteering effectively. While it may seem more intimidating, staying at the front during the race can not only help keep you out of trouble but also allow you carry more speed into and out of the corners. Get caught up behind too many other riders and you get what is called the accordion effect. As more and more riders try to squeeze into a turn, the more you have to slow down. Then as the front riders accelerate out of the turn those that are too far back have to waste energy by regaining the speed that was scrubbed due to too much braking. Doing this over and over again can cause gaps in the group to open, or even worse, the gaps can cause you to eventually lose contact with the main bunch. Staying near the front keeps you from having to surge again and again and again. Being efficient in corners saves you a tremendous amount of energy over the course of the race. Staying calm, using the draft and keeping an even speed allows you to get carried on in the group and save your legs. It also helps you keep your position. The closer you are to the front the less you have to apply your brakes. 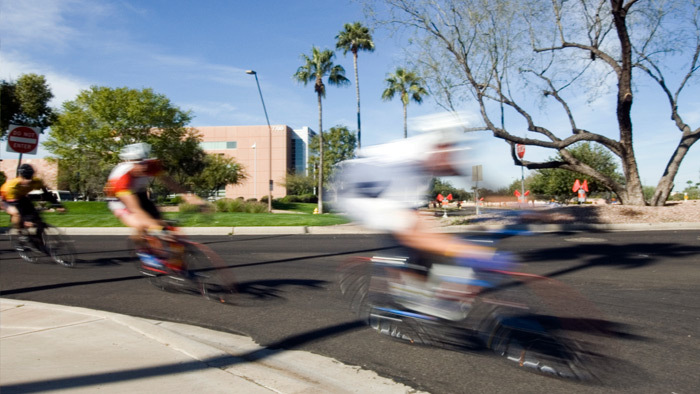 Learning to corner safely and quickly is a key aspect to racing a criterium. Practice these skills on your solo and group rides and then apply what you learn on race day. There can be a large learning curve when you are trying to get good at criteriums, and working on these skills will help you be a better racer.